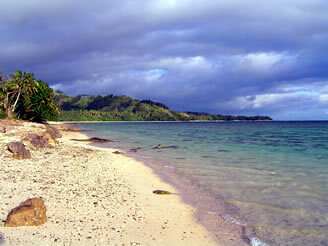 Viti Levu is the largest of Fiji's 300+ islands. It also has the highest population, with around 75% of Fijians living here. The 3 largest cities are Suva, Lautoka and Nadi (in order of size). Lautoka: Lautoka is on the western side of Viti levu, about a 30 minute drive north of Nadi.Known as "the sugar city", Lautoka has a population of approximately 55,000. This is not really a tourism area - while you can find some good (and quite cheap) accomodation here, the city is not geared towards tourist activities. It is more an industrial city, with the sugar mill being the biggest employer in the area. Nadi: Pronounced as Nandi, this is Fiji's third largest city. 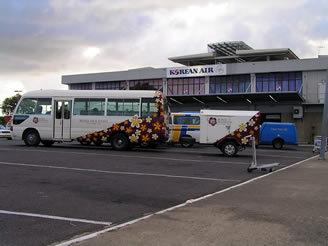 It is also the main hub for tourist arivals, as the majority of international flights land at the Nadi International airport. The permanent population is around 50,000, although the number of tourists make this figure much higher. Around 140km east to west, and 100km north to south, Viti levu is divided in half by a north-south mountain range. The tallest of these mountains is mount Tomanivi, at 1,324 meters. This mountain range has the effect of creating two distinct climates on Viti Levu. The east is more lush, higher rainfall and humidity, while the west side is dryer, and tends to get a little hotter over the summer months. This difference in climate means that the west is more suitable for sugar cane, and the east is good for dairy farming. The interior of Viti Levu is rolling hills and mountains, some covered in native forest, and others cleared for sugar and other crops. The Sigatoka valley runs up the middle of the island, and this area is known as "the salad bowl". Looking For More Transport Related Information?